Former MK Michael Ben-Ari has called on Knesset members to visit the Border Patrol officer who was arrested on Tuesday, apparently on the basis of autopsies conducted by the Palestinian Authority (PA) indicating an Arab rioter was killed in the Nakba Day riots this May by live ammunition. The rioter was one of at least 150 local Arabs besieging Ofer Prison to the north of Jerusalem. 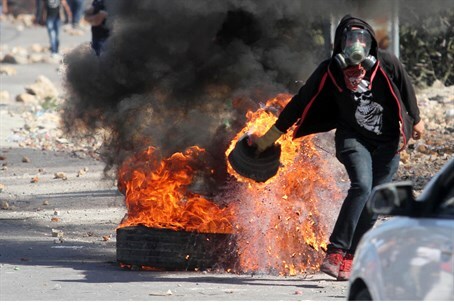 The rioters threw rocks and burning tires at police and soldiers in an apparent attempt to free jailed terrorists, aside from the "Nakba" theme of demonstrating against Israel's very existence. Ben-Ari posted a video he shot from the very site to his Facebook page this Thursday, in which he called on MKs "from the Likud, from Jewish Home, from Yisrael Beytenu, everyone with a Jewish heart: go to this prisoner and tell him we will not abandon you." In urging the MKs to demand the officer's release, Ben-Ari warned this case could set a precedent by which the "next time a soldier will not defend himself and we will G-d forbid be at a funeral. ...Give him backing! Our children, our soldiers are heroes and not murderers." "The minute 30 MKs go to visit the combat soldier, the State Attorney won't be able to sacrifice him to show what an 'ethical army' we are (like they did to Col. Shalom Eisner)," wrote Ben-Ari. Referencing the murder of a 20-year-old IDF soldier in Tel Aviv this Monday, Ben-Ari added "if Almog Shiloni hy''d had preempted the murderer who stabbed him to death he too would be sitting in jail now and be investigated...for killing a terrorist!" Security personnel have been facing more and more legal red tape while faced with ever bolder acts of Arab terrorism, although the IDF finally this week began giving orders allowing soldiers to open fire when terrorists shoot potentially lethal fireworks at them. Regarding the particular case of the arrested Border Patrol officer, aside from the context that the rioter was part of a violent mob attacking a prison, other suspicious points remain in the case - such as how exactly he died, given video evidence. While the PA autopsy claimed the rioter was killed by a live round, the IDF initially stated that only rubber bullets were fired to try and break apart the violent riot. Casting further doubts on the point is CCTV footage that was released by blogger Elder of Ziyon at the time of the incident, which elucidated the questionable nature of the limited CCTV video evidence published earlier by leftist groups and Arab activists. In one section of the video, two Arab assailants who died in the riots are seen falling but not a drop of blood is left behind, despite the claims that they were shot by bullets that went through their bodies. In both cases the collapsed rioters are removed, and leave behind perfectly clean pavement.